Philip IV (Spanish: Felipe, Portuguese: Filipe; 8 April 1605 – 17 September 1665) was King of Spain (as Philip IV in Castile and Philip III in Aragon) and Portugal (as Philip III). He ascended the thrones in 1621 and reigned in Spain until his death and in Portugal until 1640. 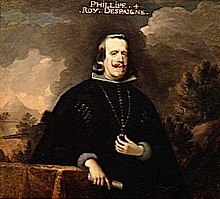 Philip is remembered for his patronage of the arts, including such artists as Diego Velázquez, and his rule over Spain during the Thirty Years' War. Spanish Netherlands, gold souverain or 'Lion d'or', struck 1633 in Tournai under King Philip IV of Spain. Obv: Crowned lion brandishing a sword, 1633. Rev: Crowned shield of Philip IV within Golden Fleece collar. On the eve of his death in 1665, the Spanish Empire had reached approximately 12.2 million square kilometers (4.7 million square miles) in area but in other respects was in decline, a process to which Philip contributed with his inability to achieve successful domestic and military reform. Philip IV was born in Royal Palace of Valladolid, and was the eldest son of Philip III and his wife, Margaret of Austria. 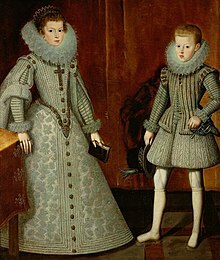 In 1615, at the age of 10, Philip was married to 13-year-old Elisabeth of France, although the relationship does not appear to have been close; some have even suggested that Olivares, his key minister, later deliberately tried to keep the two apart to maintain his influence, encouraging Philip to take mistresses instead. Philip had seven children by Elisabeth, with only one being a son, Balthasar Charles, who died at the age of sixteen in 1646. The death of his son deeply shocked the king, who appears to have been a good father by the standards of the day. Elisabeth was able to conspire with other Spanish nobles to remove Olivares from the court in 1643, and for a brief period she held considerable influence over Philip; by the time of her death, however, she was out of favour, following manoeuvering by Olivares' successor, Luis de Haro. Philip remarried in 1646, following the deaths of both Elisabeth and his only legitimate heir. His choice of his second wife, Maria Anna, also known as Mariana, Philip's niece and the daughter of the Emperor Ferdinand, was guided by politics and Philip's desire to strengthen the relationship with Habsburg Austria. Maria Anna bore him five children, but only two survived to adulthood, a daughter Margarita Teresa, born in 1651, and the future Charles II of Spain in 1661 — but the latter was sickly and considered in frequent danger of dying, making the line of inheritance potentially uncertain. Perceptions of Philip's personality have altered considerably over time. Victorian authors were inclined to portray him as a weak individual, delegating excessively to his ministers, and ruling over a debauched Baroque court. Victorian historians even attributed the early death of Baltasar to debauchery, encouraged by the gentlemen entrusted by the king with his education. The doctors who treated the Prince at that time in fact diagnosed smallpox, although modern scholars attribute his death to appendicitis. Historians' estimation of Philip gradually improved in the 20th century, with comparisons between Philip and his father being increasingly positive — some noting that he possessed much more energy, both mental and physical, than his diffident father. Philip was idealised by his contemporaries as the model of Baroque kingship. Outwardly he maintained a bearing of rigid solemnity; foreign visitors described him as being so impassive in public he resembled a statue, and he was said to have been seen to laugh only three times in the course of his entire public life. Philip certainly had a strong sense of his 'royal dignity', but was also extensively coached by Olivares in how to resemble the Baroque model of a sovereign, which would form a key political tool for Philip throughout his reign. Philip was a fine horseman, a keen hunter and a devotee of bull-fighting, all central parts of royal public life at court during the period. Privately, Philip appears to have had a lighter persona. When he was younger, he was said to have a keen sense of humour and a 'great sense of fun'. He privately attended 'academies' in Madrid throughout his reign — these were lighthearted literary salons, aiming to analyse contemporary literature and poetry with a humorous touch. A keen theatre-goer, he was sometimes criticised by contemporaries for his love of these 'frivolous' entertainments. Others have captured his private personality as 'naturally kind, gentle and affable'. Those close to him claimed he was academically competent, with a good grasp of Latin and geography, and could speak French, Portuguese and Italian well. Like many of his contemporaries, including Olivares, he had a keen interest in astrology. His handwritten translation of Francesco Guicciardini's texts on political history still exists. Although interpretations of Philip's role in government have improved in recent years, Diego Velázquez's contemporary description of Philip's key weakness — that 'he mistrusts himself, and defers to others too much' — remains relevant. Although Philip's Catholic beliefs no longer attract criticism from English language writers, Philip is still felt to have been 'unduly pious' in his personal life. Notably, from the 1640s onwards he sought the advice of a noted cloistered abbess, Sor María de Ágreda, exchanging many letters with her. This did not stop Philip's becoming known for his numerous affairs, particularly with actresses; the most famous of these was his actress-mistress María Inés Calderón (La Calderona), with whom he had a son in 1629, Juan José, who was brought up as a royal prince. By the end of the reign, and with the health of Carlos José in doubt, there was a real possibility of Juan José's making a claim on the throne, which added to the instability of the regency years. During the reign of Philip's father, Philip III, the royal court had been dominated by the Sandoval noble family, most strikingly by the Duke of Lerma, Philip III's principal favorite and chief minister for almost all of his reign. Philip IV came to power as the influence of the Sandovals was being undermined by a new noble coalition, led by Don Baltasar de Zúñiga. 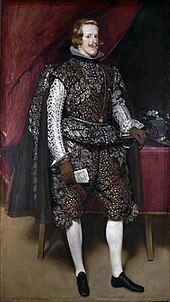 De Zúñiga regarded it as essential that the Sandovals be unable to gain an influence over the future king; de Zúñiga first began to develop his own influence over Prince Philip, and then introduced his nephew, Olivares, to the prince, ten years old at the time. At first, Philip did not particularly take to Olivares. Over the course of at least a year, however, the relationship became very close, with Philip's tendency towards underconfidence and diffidence counteracted by Olivares' drive and determination. Olivares rapidly became Philip's most trusted advisor, and when Philip ascended the throne in 1621, at the age of sixteen, he showed his confidence in Olivares by ordering that all papers requiring the royal signature should first be sent to the count-duke. Philip retained Olivares as his confidant and chief minister for the next twenty years. Early in his reign, Philip would be woken by Olivares in the morning to discuss the day's affairs and would meet with him twice more during the day, although later this routine declined until the king would hold only one short meeting on policy with Olivares each day. Philip intervened far more in policies during 1641–42, however, and it has been suggested that Philip paid more attention to policymaking than has traditionally been depicted; some recent histories go so far as to describe him as 'conscientious' in policymaking, although he is still criticised for his failure to make timely decisions. Philip himself argued that it was hardly appropriate for the king himself to go house to house amongst his ministers to see if his instructions were being carried out. The close relationship between Philip and Olivares was demonstrated by their portraits' being placed side by side at the Buen Retiro palace — an act unheard-of in Europe at the time. Philip's relationship with Olivares, however, was not a simplistic one. The pair had many rows and arguments over the course of their relationship, both as a result of their different personalities and differences of opinion over policies. Initially, Philip chose to confirm the reappointment of his father's household to assuage grandee opinion. Under the influence of de Zúñiga and Olivares, however, Philip was then quick to place de Lerma's estates — expanded considerably during his long period as favourite — under administration, and to remove from office Cristóbal de Sandoval, Duke of Uceda, de Lerma's son, who had initially helped de Zúñiga remove his own father from office to advance his own position. Philip's initial announcements reflected an intent to reform the monarchy to the sober, moral position it had been under his grandfather, including selecting ministers whose grandfathers had served under Philip II. Philip has in the past been considered to be 'unimaginative' in his politics, but recent histories have stressed the more radical elements of his first two decades in power. There was a febrile atmosphere in Spain in the early 17th century, with numerous arbitrista offering various advice on how to solve Spain's various ills; this advice could, and would, be given in person by those of the lower classes to the king on suitable occasions, provided it was presented with the aim of strengthening the crown. Those debates extended to the nature of the monarchy. It has been suggested that the writers of the period who best capture Philip's view of royal authority were Justus Lipsius and Giovanni Botero, who promoted religiously inspired, stoic self-sacrifice and a view of Habsburg family-led hegemony respectively. Whilst at one level conservative — harking back in foreign policy to the period of Phillip II, invoking traditional values at home — Philip's policies were also radical, rejecting the policy towards the rebellious Dutch that had held since 1609, entering into the Thirty Years' War, and introducing a system of junta, or small committee, government across Spain in competition to the traditional system of royal councils. Following Olivares' fall from power amidst the crisis of 1640–43, the victim of failed policies and jealousy from the nobles excluded from power, Philip initially announced that he would rule alone, becoming in effect his own first minister. The junta system of government began to be dismantled in favor of the older council system. In due course, however, this personal rule reverted to rule through a royal favorite, initially Luis de Haro, a nephew of Olivares and a childhood playmate of Philip's, and the counter-reform of the committee system halted. De Haro has not been highly regarded by historians; the comment of one, that de Haro was the 'embodiment of mediocrity', is not atypical. After de Haro's death in 1661, Olivares' son-in-law, the Duke of Medina de las Torres, became royal favourite in his place. Philip was to reign through the majority of the Thirty Years' War in Europe, a turbulent period of military history. 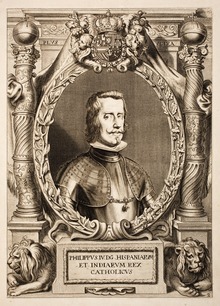 In Philip III's final years, Baltasar de Zúñiga had convinced him to intervene militarily in Bohemia and the Electorate of the Palatinate on the side of Emperor Ferdinand II. Once Philip himself came to power, he was convinced by de Zúñiga, appointed his principal foreign minister, and Olivares that he should commit Spain to a more aggressive foreign policy in alliance with the Holy Roman Empire. This would lead Philip to renew hostilities with the Dutch in 1621 in an attempt to bring the provinces to the negotiating table with the aim of achieving a peace treaty favourable to Spanish global interests. Philip's government would pursue a 'Netherlands first' strategy throughout the war until 1643. Despite this shift in policy, Philip does not seem to have been particularly bellicose; early on he noted that having inherited such a large empire, war somewhere across his domains was an inevitable condition, and he appeared genuinely upset when he came to power and contemplated how much the people of Castile had paid 'in blood' to support the wars of his royal predecessors. The 1620s were good years for Spanish foreign policy: the war with the Dutch went well, albeit at great expense, culminating in the retaking of the key city of Breda in 1624. By the end of the decade, however, Philip's government was faced with the question of whether to prioritise the war in Flanders or Spain's relationship with France during the War of the Mantuan Succession (1628–31). 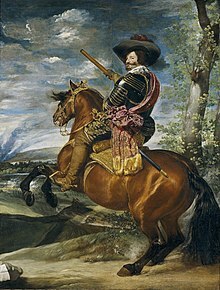 Philip's advisors recommended prioritising the war in Flanders, taking action to safeguard the Spanish Road to the Netherlands but at the cost of antagonising Louis XIII. Strategically this was to prove a disaster. Despite fresh Spanish successes in the mid-1630s — in particular, the triumph of Philip's government in raising a fresh Spanish army, marching it into Germany to defeat the Swedish-led Protestant forces at the Battle of Nördlingen in 1634 — the increased tensions with France made war between the two Catholic states increasingly inevitable. 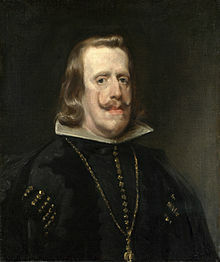 Olivares advised Philip that the coming war with France would be all or nothing; Spain would win or fall by the result. The Spanish-French war that ensued from 1635 onwards was not a foregone conclusion. Early Spanish successes threatened Paris, and even after the Spanish defeat at Rocroi, Spain remained a strong opponent. But from 1640 onwards, a period which saw large-scale revolts across Spanish territories in protest against the rising costs of the conflict, Spain was finding it difficult to sustain the war. Philip reacted to the increased French threat by finally abandoning his 'Netherlands first' strategy; resources for the Army of Flanders were savagely cut, and the fight against the French-supported rebels Catalonia took the first priority. Shortly after Rocroi, Philip — now having had to dismiss his favourite, Olivares — issued instructions to his ambassadors to seek a peace treaty. The Peace of Westphalia, delivered by Olivares' replacement Luis de Haro, resolved the long running Eighty Years' War in the Netherlands and the wars in Germany, but the conflict with France dragged on. Philip responded to the perceived weakness of France during the Fronde rebellions of 1648 by continuing the fight; he took personal responsibility for the decision to start a fresh, and ultimately successful, offensive against the French in Catalonia in 1651. True victory over France never emerged, however, and by 1658, after the loss of Dunkirk to an Anglo-French force, Philip was personally desperate for peace. The Treaty of the Pyrenees in 1659, and the marriage of Philip's daughter Maria Theresa to the young King Louis XIV finally brought his long running European wars to an end. By the late 1620s, the Spanish army was no longer as dominant on the battlefield as it once had been. The feared tercio regiments, composed of well-disciplined pikemen, were increasingly appearing inflexible and outmoded in the face of the new Swedish and Dutch formations with a higher proportion of musketeers. Philip and Olivares attempted to address the perceived weaknesses of the army, which they concluded were primarily due to the falta de cabezas, or a lack of leadership. In keeping with their wider agenda of renewing the concepts of duty, service and aristocratic tradition, the king agreed to efforts to introduce more grandees into the higher ranks of the military, working hard to overcome the reluctance of many to take up field appointments in the Netherlands and elsewhere. The results were not entirely as hoped. The grandees dragooned into service in this way were disinclined to spend years learning the normal professional military skill set; they wished 'to start out as generals and soldiers on the same day', to quote one disgruntled career soldier.[who?] By the 1630s, the king was waiving the usual rules to enable promotion to higher ranks on a shorter timescale, and having to pay significantly inflated salaries to get grandees to take up even these appointments. The performance of these officers at battles such as Rocroi left much to be desired. Philip was also notable for his interest in the Spanish armada, or navy. Shortly after taking power he began to increase the size of his fleets, rapidly doubling the size of the naval budget from the start of his reign, then tripling it. Philip is credited with a 'sensible, pragmatic approach' to provisioning and controlling it. He was prepared to involve himself in considerable details of naval policy; he was commenting on the detail of provisions for the armada in 1630, for example. The Junta de Armadas was the only junta committee to survive the fall of Olivares intact. Even after the disastrous Battle of the Downs, Philip remained closely interested in his navy, including ensuring ministerial attention. In 1646, de Haro was personally involved in supplying and equipping the Atlantic fleet from Cadiz. Throughout the period there was no 'weakening of the importance attached to naval forces' by the king, who argued that joint land and naval operations were essential. Some of his conclusions on naval policy were quite advanced: after the peace of 1648, Philip argued that the Dutch fleets off the Spanish peninsula were actually good for trade, despite concerns from his senior officials, since they provided protection against the English and French navies. Philip had inherited a huge empire from his father, spanning the known world, but many of his most difficult challenges as king would stem from domestic problems in Spain itself. Spain in the early 17th century was a collection of possessions — the kingdoms of Castile, Aragon, Valencia and Portugal, the autonomous provinces of Catalonia and Andalusia, complete with the wider provinces of Naples, the Netherlands, Milan etc. — all loosely joined together through the institution of the Castile monarchy and the person of Philip IV. Each part had different taxation, privileges and military arrangements; in practice, the level of taxation in many of the more peripheral provinces was less than that in Castile, but the privileged position of the Castilian nobility at all senior levels of royal appointment was a contentious issue for the less favoured provinces. This loose system had successfully resisted reform and higher taxation before, ironically resulting in Spain's having had historically, up until the 1640s at least, fewer than the usual number of fiscal revolts for an early modern European state. In the first years of his reign, heavily influenced by his royal favourite Olivares, Philip focused on efforts to reform the most chaotic aspects of this system. Frustrated by the notorious slowness of the system of royal councils, Philip supported Olivares' establishment of juntas — small committees designed to circumvent the more formal system and to enact policies quickly. Although successful, these juntas excluded many of the traditional grandees and caused resentment. Olivares put forward the idea of a Unión de Armas, or 'Union of Arms'. This would have involved establishing a force of 140,000 paid soldiers, supported by equitable taxes from across the Empire, and has been termed 'the most far-sighted proposal of any statesman of the age'; in practice, however, it met fierce opposition from the various regional assemblies and the plan was withdrawn. During the 1620s, again influenced by a desire to reform Spanish life for the better, Philip also passed considerable legislation with puritanical overtones. In 1623, he closed all the legal brothels in Spain, extended the dormant sumptuary laws on luxury goods and supported Papal efforts to regulate priests' sexual behaviour more tightly. Philip had clear intentions to try to control the Spanish currency, which had become increasingly unstable during the reign of his father and grandfather, but in practice, inflation soared. Partly this was because in 1627 Olivares had attempted to deal with the problem of Philip's Genoese bankers — who had proved uncooperative in recent years — by declaring a state bankruptcy. With the Genoese debt now removed, Olivares hoped to turn to indigenous bankers for renewed funds. In practice, the plan was a disaster. The Spanish treasure fleet of 1628 was captured by the Dutch, and Spain's ability to borrow and transfer money across Europe declined sharply. By the 1630s, Philip's domestic policies were being increasingly impacted by the financial pressures of the Thirty Years' War, and in particular the growing war with France. The costs of the war were huge, and whilst they had largely fallen upon Castile, the ability of the crown to raise more funds and men from this source was increasingly limited. Philip and his government were desperately trying to reduce the responsibilities of central government in response to the overstretch of the war, and various reform ideas that might have been pursued during the 1620s were rejected on this basis. Financial restraints and higher taxes were put in place, but Philip was increasingly selling off regalian and feudal rights, along with much of the royal estate to fund the conflict. It has been argued that the fiscal stringencies of the 1630s, combined with the strength and role of Olivares and the juntas, effectively cut Philip off from the three traditional pillars of support for the monarchy: the grandees, the Church and the Council of Castile. Crisis came in 1640. An attempt by Olivares to intervene in Catalonia to deal with the French invasion threat resulted in revolt. An alliance of Catalan rebels and French royal forces proved challenging to suppress, and in trying to mobilise Portuguese noble support for the war, Olivares triggered a second uprising. Lisbon's nobles expelled Philip, and gave the throne to the Braganzas, marking the end of sixty years of the Iberian Union and the beginning of the Portuguese Restoration War. The next year, the Duke of Medina Sidonia attempted another rebellion against Philip from Andalusia, possibly attempting to reproduce the Braganzas' success in Portugal. Although Philip and Olivares were able to repress the ducal revolt, Philip had found himself increasingly isolated. On his return from Zaragoza, where he had been commanding the army, he found only one of the Castilian nobility arrived at court on Easter Day 1641. The threat of Philip's being deposed by the grandees of Castile seemed increasingly real. 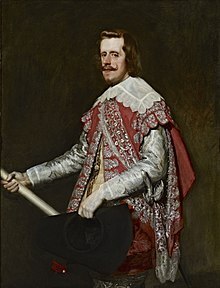 Much shaken by events, Philip's solution was to remove his royal favourite Olivares from office in 1643 in an attempt to compromise with the Spanish elite. He announced he would rule alone, rejecting both the concept of a royal favourite as first minister and the system of junta government, which he began to dismantle in favour of the older system of royal councils. Clemency was shown to the Duke of Medina Sidonia. The situation began to stabilise, and before long Philip felt secure enough to revert to his preferred method of government. Luis de Haro, Olivares' nephew, took over as favourite and minister and the counter-reform of the juntas halted. The spark of reform from Philip's earlier years never returned, however. The Catalan rebellion dragged on for several years. In 1652, the Spanish army retook Barcelona and Philip issued an amnesty for the rebels, promising to respect traditional customs and rights in the future. Prince Baltasar Carlos with the Count-Duke of Olivares outside the Buen Retiro palace, by Diego Velázquez, 1636. Philip has been remembered both for the 'astonishing enthusiasm' with which he collected art and for his love of theatre. On the stage, he favoured Lope de Vega, Pedro Calderón de la Barca, and other distinguished dramatists. Philip has been credited with a share in the composition of several comedies. Court theatre used perspective scenery, a new invention from Italy not used in commercial theatre at the time. Some writers have likened the illusion of Baroque royal theatre to the illusion of kingly power the performances were designed to reinforce. Some recent scholarship has suggested that Philip's financial sponsorship of playwrights, however, may have been less extensive than once thought. Artistically, Philip became famous for his patronage of his court painter Diego Velázquez, who originated from Seville; mutual contacts caused him to become known to Olivares, who came from the same region. Velázquez was summoned to Madrid by the king in 1624. Despite some jealously from the existing court painters, Velázquez rapidly became a success with Philip, being retained for the rest of his career until his death, painting a celebration of the Treaty of the Pyrenees for Philip. The king and Velázquez shared common interests in horses, dogs and art, and in private they formed an easy, relaxed relationship over the years. Philip supported a number of other prominent painters, including Eugenio Caxés, Vicente Carducho, Gonzales and Nardi. Philip obtained paintings from across Europe, especially Italy, accumulating over 4,000 by the time of his death; some have termed this unparalleled assemblage a 'mega-collection'. Philip was nicknamed el Rey Planeta, the 'Planet King', by his contemporaries, and much of the art and display at his court has been interpreted in the context of his need to project power and authority, over both Spaniards and foreigners alike. 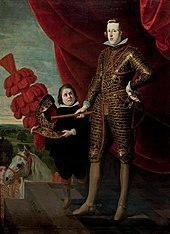 Older interpretations, which perceived Philip's court as being completely decadent, have been largely superseded, but the art and symbolism of the period certainly did not reflect the wider threat and decline of Spanish power. Indeed, the limited Spanish military successes of the period were celebrated by royal artists to a disproportionate extent. Numerous artists from the Spanish Netherlands produced work extolling the Army of Flanders, including Vrancx, Snaeyers, Molenaer and de Hondt. The re-capture of Breda alone resulted in major works by Velázquez and the French etcher Jacques Callot, in addition to various plays and books. María de Ágreda, a religious advisor to Philip IV during the second half of his reign. The Catholic religion and its rituals played an important part in Philip's life, especially towards the end of his reign. Depressed by events across his domains, he became increasingly concerned with religious affairs. In particular, Philip paid special devotions to a painting of the Nuestra Señora del Milagro, the Virgin of Miracles; the painting was said to miraculously raise and lower its eyes in response to prayer. Whilst married to Elisabeth, Philip had placed their children under the protection of this image; married to Mariana, they undertook special religious ceremonies together under the gaze of the painting. Philip also had a large standard made with the image of the painting on one side and the royal coat of arms on the other, brought out in processions each year on 12 July. As well as marking a strong personal religious belief, this increasingly visible link between the crown, the Church and national symbols such as the Virgin of Miracles, represented a key pillar of support for Philip as king. Monarchs during the period also had a key role in the canonization process and could utilise this for domestic or international political effect. Philip, for example, keen to reach out to his Portuguese subjects, put his considerable influence behind the case for Isabella of Portugal, a 14th-century role model of a 'perfect wife', to great effect, ultimately paying for a lavish celebration in Lisbon after her canonisation in 1625. Internationally, it was important for Spanish prestige for her to receive at least a proportionate, and ideally greater, share of new saints than other Catholic kingdoms, and Philip sponsored a flurry of texts and books supporting Spain's candidates, particularly in competition with Catholic France. Portrait of Philip in France for his daughter, Maria Theresa. During the emergency of 1640–43, Philip appears to have had a crisis of faith. Philip genuinely believed the success or failure of his policies represented God's favour and judgement on his actions. The combination of the revolts, the French advances and the loss of his trusted favourite Olivares appears to have deeply shaken him. Queen Isabella and the new president of the Council of Castile, Don Juan Chumacero — both involved in the removal of Olivares — encouraged the king to invite mystics and visionaries from across Europe to his court at Zaragoza. The mystics' principal advice centred on the importance of the king's rejecting Olivares' replacement, de Haro and the remaining pro-Olivares nobles at court. The various mystics were not acceptable to broader Spanish noble opinion and, with de Haro's encouragement, they were ultimately dismissed. 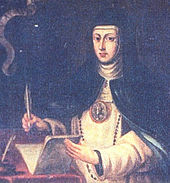 Instead, Philip turned to a better established female mystic, Sister María de Ágreda, a prioress known for her religious writings. He asked her to correspond with him and to advise him in spiritual matters. The two became regular correspondents throughout the remainder of their lives. This is documented in over 600 confidential letters between them over a period of twenty-two years. Philip clearly believed that Maria could intercede with God on his behalf and provide advice on what God wished him to do, to improve Spain's failing fortunes. Most believe that Philip was involved in protecting Maria from the Inquisition's investigation of 1650. Philip's son, as Charles II, protected her writings from later censorship. In the 1630 Treaty of Madrid, Philip was styled "Philip, by the grace of God king of the Spains, Both the Sicilies, Jerusalem, the Indies, etc., archduke of Austria, duke of Burgundy, Milan, etc., count of Habsburg, Tyrol, etc." in full and "the Most Serene Philip IV, Catholic King of the Spains," for short. In the 1648 Treaty of Münster, he was styled "Don Philip the Fourth, by the grace of God king of Castile, Leon, Aragon, the Two Sicilies, Jerusalem, Navarre, Granada, Toledo, Valencia, Galicia, Majorca, Minorca, Seville, Cerdagne, Cordoba, Corsica, Murcia, Jaen, Algeciras, Gibraltar, the Canary Islands, the Eastern and Western Indies, the islands and terra firma of the Ocean, archduke of Austria, duke of Burgundy, Brabant, Milan, count of Habsburg, Flanders, Tyrol, Barcelona, lord of Biscay and Molina, etc." in full and "King of the Spains, Don Philip the Fourth and King of Portugal and the Algarves Don Philip the Third ", for short. Philip IV's reign, after a few years of inconclusive successes, was characterized by political and military decay and adversity. He has been held responsible for the decline of Spain, which was mainly due to organic causes largely beyond the control of any one ruler. 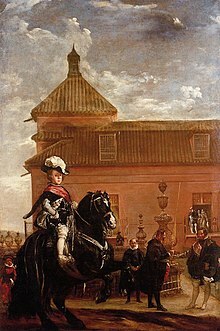 Philip IV died broken-hearted[clarification needed] in 1665, expressing the pious hope that his surviving son, Charles II, who was only 4 years old at the time, would be more fortunate than himself. On his death, a catafalque was built in Rome to commemorate his life. In his will, Philip left political power as regent on behalf of the young Charles II to his wife Mariana, with instructions that she heed the advice of a small junta committee established for this purpose. This committee excluded John, Philip's illegitimate son, resulting in a chaotic powerplay between Mariana and John until his death in 1679. Maria Theresa of Austria, Infanta of Spain (1638–1683), married Louis XIV of France and had issue. Charles II of Spain (6 November 1661 – 1 November 1700) married Marie Louise d'Orléans, no issue. Married secondly Maria Anna of Neuburg, no issue. Kristiaan P. Aercke, The Gods of Play: Baroque Festival Performances as Rhetorical Discourse. Albany: State University of New York Press (1994). M. S. Anderson, War and Society in Europe of the Old Regime, 1618–1789. London: Fontana (1988). Luis R. Corteguera, For the Common Good: Popular Politics in Barcelona, 1580–1640. Ithaca: Cornell University Press (2002). Graham Darby, Spain in the Seventeenth Century. Longman (1994). France G. Davenport, European Treaties Bearing on the History of the United States and Its Dependencies. The Lawbook Exchange, Ltd. (2004). J. H. Elliot, The Statecraft of Olivares. in: J.H. Elliot and H. G. Koenisburger (ed.). The Diversity of History: Essays in Honour of Sir Henry Butterfield. London: Routledge and Kegan Paul (1970). J. H. Elliot, The Revolt of the Catalans: A Study in the Decline of Spain, 1598–1640. Cambridge: Cambridge University Press (1984). J. H. Elliot, Richelieu and Olivares. Cambridge: Canto Press (1991). Filippe Fernándo-Armesto, The Improbable Empire, in: Raymond Carr (ed.). Spain: A History. Oxford: Oxford University Press (2000). David Goodman, Spanish Naval Power, 1589–1665: Reconstruction and Defeat. Cambridge: Cambridge University Press (2002). Eleanor Goodman, Conspicuous In Her Absence: Mariana of Austria, Juan José of Austria, and the Representation of Her Power, in: Theresa Earenfight (ed. ), Queenship and Political Power in Medieval and Early Modern Spain. Aldershot: Ashgate (2005). Martin Hume, Court of Philip IV: Spain in Decline. New York: G. P. Putnam's Sons (1907). Chiyo Ishikawa, Spain in the Age of Exploration, 1492–1819. University of Nebraska Press (2004). Henry Kamen, Vicissitudes of a World Power, 1500–1700, in: Raymond Carr (ed.). Spain: A History. Oxford: Oxford University Press (2000). Henry Kamen, Spain, 1469–1714: A Society of Conflict. Harlow: Pearson Education (2005). Ruth Mackay, The Limits of Royal Authority: Resistance and Authority in Seventeenth Century Castile. Cambridge: Cambridge University Press (1999). Thomas Munck, Seventeenth Century Europe, 1598–1700. London: Macmillan (1990). Geoffrey Parker, Europe in Crisis, 1598–1648. London: Fontana (1984). Geoffrey Parker, The Army of Flanders and the Spanish Road, 1567–1659. Cambridge: Cambridge University Press (2004). J. V. Polisensky, The Thirty Years War. London: NEL (1971). David Ringrose, Spain, Europe and the "Spanish Miracle", 1700–1900. Cambridge: Cambridge University Press (1998). Jeremy Robbins, The Challenges of Uncertainty: An Introduction to Seventeenth Century Spanish Literature. Lanham: Rowan and Littlefied (1998). R. A. Stradling, Philip IV and the Government of Spain, 1621–1665. Cambridge: Cambridge University Press, Cambridge 1988, ISBN 0-521-32333-9. R. A. M. Stevenson, Velazquez. London: G. Bell Sons (1912). C. V. Wedgwood, The Thirty Years War. London: Methuen (1981). Patrick Williams, The Great Favourite: The Duke of Lerma, and the court and government of King Philip III of Spain, 1598–1621. Manchester: Manchester University Press (2006). Perez Zagorin, Rebels and Rulers, 1500–1660. Volume II: Provincial rebellion: Revolutionary civil wars, 1560–1660. Cambridge: Cambridge University Press (1992). ^ a b Stevenson, p. 12. ^ a b Kamen, p. 217. ^ a b c Aercke, p. 140. ^ a b c d Wedgwood, p. 144. ^ a b c Elliot, Richelieu and Olivares, p. 47. ^ a b Stevenson, p. 7. ^ a b Kamen, p. 213-214. ^ a b Aercke, p. 160. ^ a b Parker, Europe in Crisis, p. 232. ^ a b c Elliot, The Revolt of the Catalans, p. 194. ^ Elliot, The Revolt of the Catalans, p. 526. ^ Elliot, The Statecraft of Olivares, p. 121. ^ Elliot, Richelieu and Olivares, p. 32. ^ Parker, Europe in Crisis, p. 234. ^ Parker, Europe in Crisis, p. 264. ^ a b Polisensky, p. 224. ^ a b Kamen, p. 228. ^ Parker, The Army of Flanders and the Spanish Road, p. 219. ^ Kamen, Vicissitudes of a World Power, p. 156. ^ Parker, The Army of Flanders and the Spanish Road, p. 221. ^ Elliot, The Revolt of the Catalans, p. 539. ^ a b Ishikawa, p. 77. ^ a b c Parker, The Army of Flanders and the Spanish Road, p. 101-103. ^ Goodman, Spanish Naval Power, p. 45. ^ Goodman, Spanish Naval Power, p. 32. ^ Goodman, Spanish Naval Power, p. 157. ^ Goodman, Spanish Naval Power, p. 34. ^ Goodman, Spanish Naval Power, p. 156. ^ Goodman, Spanish Naval Power, p. 26. ^ Parker, Europe in Crisis, p. 61. ^ Parker, Europe in Crisis, p. 248. ^ a b Munck, p. 53. ^ Parker, 2005,[clarification needed] p. 81. ^ a b Stradling, p. 20. ^ Elliot, Richelieu and Olivares, p. 8. ^ Parker, Europe in Crisis, p. 262-263. ^ Andrew Graham-Dixon. "The Mystical North". The Art of Spain. Season 1. Episode 3. 14 February 2008. ^ a b Robbins, p. 27. ^ a b Aercke, p. 142. ^ Goodman, Conspicuous In Her Absence, p. 169-170. ^ a b c d Haliczer, p. 27. ^ Goodman, Conspicuous In Her Absence, p. 164. ^ Anselm de Gibours (1726). Histoire généalogique et chronologique de la maison royale de France [Genealogical and chronological history of the royal house of France] (in French). 1 (3rd ed.). Paris: La compagnie des libraires. p. 149. This article incorporates text from a publication now in the public domain: Chisholm, Hugh, ed. (1911). "Philip IV., king of Spain" . Encyclopædia Britannica. 21 (11th ed.). Cambridge University Press.